A Haverhill teenager was sentenced to jail time this week for causing a fatal accident by texting while driving, raising the issues of painful consequences, criminal punishments and civil liability families can face for what is becoming an all-too-common practice. The case was the first of its kind in Massachusetts, where a ban on texting while driving took effect in 2010. As the 18-year-old driver was sentenced this week in Haverhill District Court, the public learned what criminal punishments violators can face. But the public should also be aware of what they did not see in the media: If a teen causes a car accident, they and their parents might also be sued civilly and may have to pay their victims significant financial damages. In cases involving injury and death, a parent who negligently entrusts a car they own to a teen who they have cause to know is texting behind the wheel may be found liable for negligent entrustment. If so, then the parent might be sued and forced to pay damages to a victim. On February 20, 2011, Aaron Deveau, 18, was driving in Haverhill and crossed the center line, striking a car driven by a 56-year-old New Hampshire man. The man died of his injuries a few weeks later, while his passenger, a 59-year-old Haverhill woman, was severely injured and left with physical disabilities. After the man’s death, Deveau was charged with motor vehicle homicide and texting and causing injury. The motor vehicle charge carried a maximum sentence of two and a half years in jail and the texting and causing injury was punishable by up to two years. A Haverhill District Court jury found him guilty of both charges and Judge Stephen Abana sentenced him to the maximum penalty. However, Deveau will serve a year concurrently on both charges and the balance of the charges is suspended for five years. His license will be suspended for 15 years on the motor vehicle homicide charge. 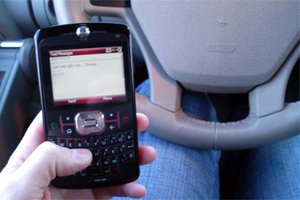 Prosecutors have been able to charge negligent drivers with texting and causing injury since September 30, 2010, when the Massachusetts law banning texting while driving took effect. The law banning use of electronic devices while driving is M.G.L. Chapter 90, Section 13B. If drivers cause injury or death, they can be criminally charged under M.G.L. Chapter 90, Section 24(2)(a). The law applies to all electronic communications, including sending and reading texts, sending and reading emails, and any sort of internet browsing. For non-criminal charges (if there is no accident or injury), the fine is first $100, then $250, and then $500. Insurance surcharges do not apply to the civil penalties. The Boston car accident lawyers at Breakstone, White & Gluck have over 80 years experience handling serious personal injury cases involving motor vehicle accidents, bicycle accidents and pedestrian accidents. If you have been injured, it is important to learn your rights. For a free legal consultation, contact us today at 800-379-1244 or 617-723-7676 or use our contact form.